Between Genes and Memes - Transfer east west is the culmination of a series of exhibitions and performance events that developed as a result of international cooperation and exchanges initiated by the TNS Foundation. "we move in between, where a found question is more valuable than a quick formulated answer. what we are leads to what we do. what we rely on is our memory." the performance event points to a theory, which becomes more and more important in research of further development of mankind. hence the transfer of information, which determines our thinking and dealing, the way how we view, experience and judge the world, bases on different systems. the term "meme" was made up by the Oxford-zoologist Richard Dawkins in 1976. it is derived from the latin word MEMORIA for memory. it describes a single state of consciousness, for example a thought, an idea, something what is remembered and circulates through communication. that way it is part of sociocultural evolution. memes are in contrast to genes, which are passed on through reproduction and are responsible for our biological development. through networking, globalization and technical progress informations mix and change. all together they are the material we are made of. four artistic positions open four pages of a book. an arc draws from Asia to Europe, from west to east. four outlooks offer an insight in differences and commonalities of global development. we are connected through emotions, divided through language and tradition. for one hour emotions become the universal language for artists and audience. 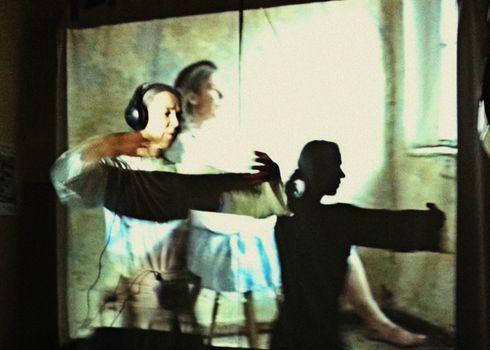 performing since 1986. coming from dance she creates performances over more than 20 years. space, time material and the input of her own body are the basis of her artistic work. she develops her performances on the fundament of experience, exploration and invention. her main concern is to retrieve and visualize connections on all levels. her works are characterized through her ability to establish contact. 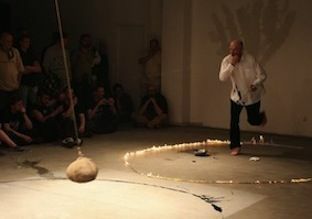 he's a performance artist since 1979, curator and organizer of numerous international projects. he says of himself: "I observe the process of permanent deconstruction of memory by the reality around me. in this context, I put questions about identity. the relationship between past and present aspects of looking for the universal order. performance, enables me to fascinating “game” between the world of reality and remembered. capture a sense of time and "influence" on the course of past events, modify them, build new configurations and their transfer to the real space. in the performance I can find the form for my ideas, intuition and biologism of the body. it’s precisely this area where I try to define my worries, desires, hopes. one of the most famous artists of the stage performance art in Korea. director of the International Performance Festival in Gwangju. his performances are very dynamic, very evocative visually, often built on the basis of the triptych. it uses specific to their culture's body language, gesture, movement. his work combines elements of Eastern and Western culture. the artist touches important topics of contemporary civilization - the threats, dehumanization, cruelty, loneliness of human, sometimes by ironic and sarcastic way. 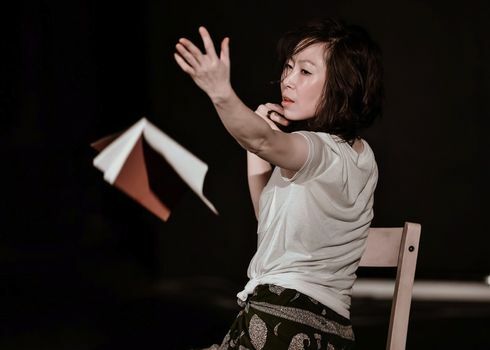 writer, performance artist, Governor - Gwangju International Media Performance Art Festival, member of 'Making Art Global Network' Gwangju. her works appear to possess a quality that crosses boundaries and cultural contexts, a type of visual poetry that activates the senses in a manner which does not compel strict interpretation. in her work takes a fascinating transformation - a wealth language of literary changes to the wealth of visual language. park's basic materials—books, ashes, paper, wax, body, sound—come together to generate motion, energy in action. in cooperation with TNS Foundation, Gdansk, OFFicyna, Szczecin and Platoon Kunsthalle, Berlin.